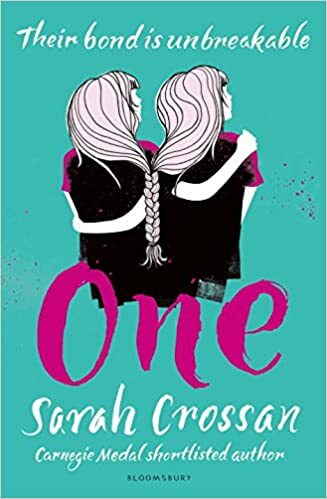 ONE BY SARAH CROSSAN REVIEW! Summery : Grace and Tippi are twins – conjoined twins. But what neither Grace or Tippi realises is that a heart-wrenching decision lies ahead. A decision that could tear them apart. One that will change their lives even more than they ever imagined. Bloomsbury were kind enough to send me “One” by Sarah Crossan for review last week after I’d seen the cover floating around online. I had very little (okay no) idea what it was actually about and wanted to dive straight in as soon as I found out it was a story about the conjoined twins, Grace and Tippi. Never before had I read anything quite like this, the idea of it seemed exciting and unusual and those are the two things I look for in a book! I finished One then gave myself a well needed four hours to process it before writing up this review. I wasn’t expecting it to be quite as emotional as it was, it conjured up a lot of feelings that I wasn’t really expecting if I’m honest. I finished the book in about two sittings as it is written completely in Prose, making it easy to get through fast. Due to the quick finish I didn’t think I had connected with the characters, turns out I was very wrong and was a crying mess by the end. Tippi is a much more outgoing person than her twin Grace. Even though they share half a body you can clearly see the differences between the characters and that’s what makes them so loveable. They have different goals in life and it breaks your heart as a reader to know they won’t both be happy. One as a whole had an extremely good sense of character. It made you think about the back story of each family going through something life changing. As a reader you can empathise with their parents and sister and the struggle they have to go through just to live their lives day to day. It was almost nice not to read about a perfect family for once. The one thing that I incredibly enjoyed about this novel was the fact it made you think deeply about your own life and how you might feel in that situation. It wasn’t until about half way through where Grace describes her sister falling and her following behind until I actually stopped to think about that action. That no matter what one person would have no choice but to follow after the other. It was actually quite moving. As previously mentioned, the book is written completely in Prose. Prose is, generally speaking a way of writing which connotes the natural flow of speech. With this style of writing you could really feel Grace’s emotions and thoughts as she told her life story. Crossan managed to pull this style off so well when I have read others that have failed. I honestly do not have one bad word to say about this novel. It ticks all the boxes for originality, creativity, humour, creating emotion from the reader and just about everything else in between. Although it is categorised as Young Adult Literature I would definitely say that anyone of any age could appreciate the story being told.